Why are we still surprised by Luis Suárez? Over the past couple of years we have written more words about Luis Suárez than we ever imagined possible. From suspensions to transfer rumors to key goals at the most opportune time, we thought we had seen it all and there was nothing left that could surprise us. But that all changed on Monday while watching Uruguay’s game on Monday when Suárez and Italy’s Giorgio Chiellini clashed in front of the Italian goal with just a few minutes left in the game. Suddenly, Suárez was on the ground holding his mouth, while Chiellini was chasing the ref, pulling at his shirt collar to show something on his shoulder, and we were left in disbelief. Did Suárez really do what we think he just did? 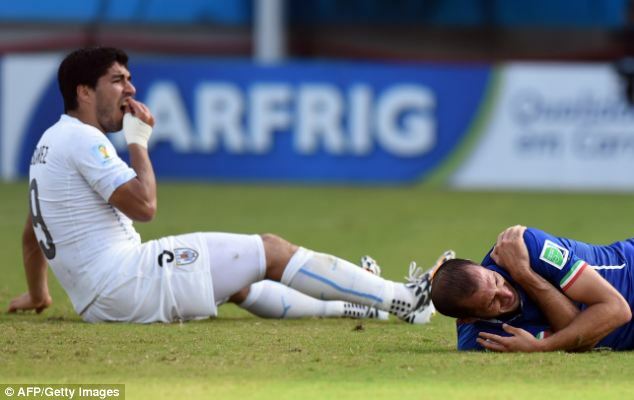 Did Suárez really just bite Chiellini during a win-or-go-home World Cup game? How is it that Suárez continues to surprise us? And what does it mean for Liverpool? Find out in our latest post at World Soccer Talk.